Who would have thought that going Rogue would involve so many lines? In Columbus Ohio there is something special about the second Friday in November. Everyone is in their scarlet and/or gray. There is a vibe about the city as we collectively gather our concious toward the united goal of seeing the Ohio State Buckeyes defeat that team up north. Yesterday was that day, and I was a part of the biggest crowd in the city. Yet there were no cries of "O-H!" nor the expected replies of "I-O!" No band played "We Don't Give A Damn For The Whole State of Michigan" and the next victory we were all rallying for was change in leadership in congress. I am a Buckeye fan, but today I am more excited because I might get to meet the biggest celebrity in the country: Sarah Palin. 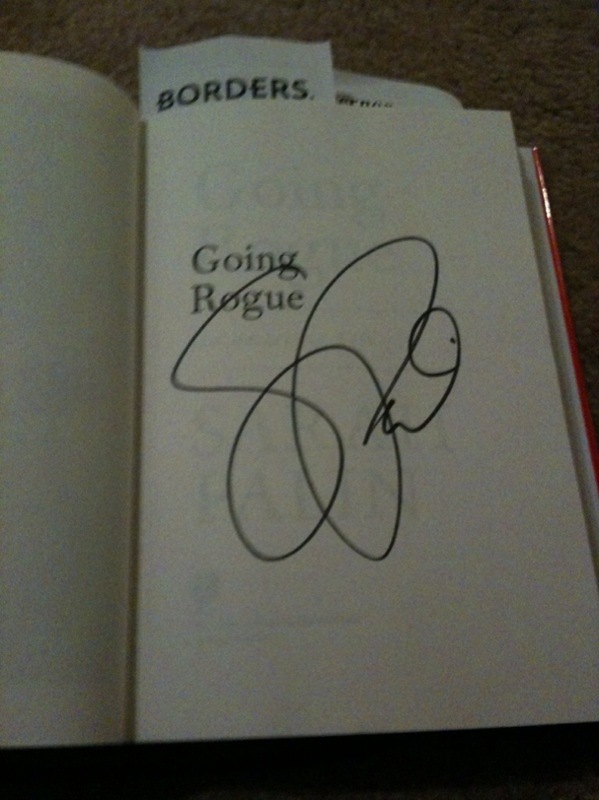 On Monday, the day before her book, "Going Rogue" was released, I just happened to catch the news saying that Sarah would be signing her book at the Borders on Sawmill Road. This particular store is only a couple miles from my house so I cleared it with work to stand in line by taking half the day off. The plan was to get in line around noon and be part of the masses who can't get enough of the conservative governor. That was plan A. My plans started to change on Thursday night. After a workout at the gym my wife, a fan of standing in lines for limited quantities of things, especially on the third Friday in November agreed with me to check out the Borders and see what time I actually needed to get there. Krystle had a better instinct than I on scoping things out because when we got there roughly a day before the signing was scheduled to start there were already a handful of tents set up for people looking to spend the night on the sidewalk in front of the store to be the first in line to get the required wristband that gets you in to get the autograph... essentially these people were standing in line for the right to stand in line. My opinion on this subject comes from comedian Ron White who once said, "I wouldn't camp out all night if I was... camping!" At this point I formulated plan C. I got up early, went to work then drove over to Borders at about 9 AM. The parking lot was filled... not just the parking lot for the book store, but the parking lot for the entire strip mall. I ended up parking across the street at Flanagan, a popular bar with sand volleyball courts. That parking lot was empty at 9 AM. I did not realize exactly how long that line was, so when I parked across the street (unseen to the north on the photo) so I ended up walking the entire length of the line, with my book in hand, to it's end three quarters around the entire complex. This was a bit disheartening. But I started talking to my fellow conservatives and making friends with them. We were all in good spirits but rumors started working their way down the line that they were cutting the wristband from 1000 to 500 because Sarah is just not getting all the signing done. We tried being optimistic despite being somewhere in the 700's. Once the line started moving we felt like progress was being made. We eventually made it to just a few dozen yards from the front door, and that's when people started coming out telling us that there were no more wristbands left. Slightly disheartened, but not defeated we said our goodbyes. I went back to work having taken most of my half-day in the morning. I grabbed some lunch worked on some stored procedures and left around 3, came home and took a nap. That evening after Krystle and I had dinner she wanted to run to the post office and Sam's Club. After that I said, let's just go to Borders and see what was going on? She couldn't believe how full the parking lot was (again, not the Borders parking lot but the lot for the whole strip mall). I made my way to the front doors of the store while Krystle looked for Rose Bowl shirts at Buckeye Corner. I was talking and joking with some other conservatives who had a group called "WALNUT" it was a spoof of ACORN. We talked for a bit when some activity started on the inside. Sarah Palin was coming out to greet the crowd! While that video was of low quality, it needs some explanation. The line at the front of the store was people who did not get wristbands but stood in line during the book signing anyway. Sarah herself came out, and unhooked the velvet rope that marked the beginning of the line. The harsh words you heard were probably the three protesters on the side. Somehow I ended up in the mob that subsequently rushed into the doors, but because I was there on a whim and not as part of an official plan D I walked around the store, tried to get a photo, but it wasn't possible because Sarah was way in the back blocked off from lookie-loos like me. I made a quick phone call and met up with Krystle... I didn't want to buy another book so we went home.... about a block from home I said, "Do you have your keys?" She said yes and I asked her to run in, grab my book while I turned the car around. I was home and back in less than fifteen minutes and they let me back in line! It looked like Plan E would be the one to work! Twelve hours later I'm back in line, but this time payoff is looking real. Again, in good spirits, joking and having fun with the other conservatives around me I was not only in line, but only feet from the entrance to the bookstore... no, now I'm in the book store... They're telling me what page the governor will sign... It's really happening! The line wound around the store and into a back part were curtians supported by pipes formed a make-shift room. An aide took my book while the governor shook my hand and signed it with a smile. Now my story of a long day can conclude with a happy ending. So, these being the largest lines I have ever stood in, Sarah Palin is officially bigger than Star Wars Episode I. Sarah Palin draws Jim Tressle level crowds (that means something in this city). And if you can believe this, Sarah Palin is also WAYYYYYYY Better looking in person!